With maximum heating temperature of 300˚C, it can harden thermoset / thermoplastic composite material. As laboratory dedicated OVEN, pressure device (air pressure), the cooling unit (water / air), a vacuum device are attached, they can make the test inside of oven easier. We can record and save the states of pressure temperature vacuum cooling of all devices. To insert temperature sensor and device, double outlet is installed inside. To insert heavy device such as molding inside of oven, it is manufactured firmly. 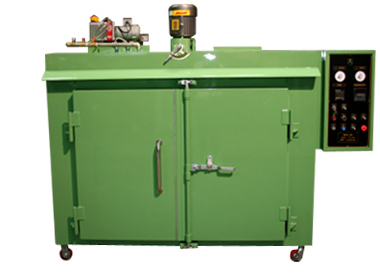 It is composite material dedicated hardening oven of which various conveniences are applied based on long experience of composite material development.